We went to Toys "R" Us again last Saturday. Just because during the previous time I forgot to bring a voucher that I received from the hospital where I gave birth to Sofia. But the thing is, voucher or no voucher, during that last time, we still get Sofia a toy. Only difference is, with the voucher, we can get a more expensive one. Hahaha. I've been meaning to get Sofia this one particular play gym that I saw in the Fisher-Price baby guide booklet. Such good marketing strategy, this Fisher-Price people. Anyway, dah ada diskaun... Why not? The voucher is valid til end of December, so I kind of pushed Iz to take us both there. Going to IOI City Mall the second time, this time with a stroller; easy on my hands but not very convenient in Toys "R" Us. The alley is narrow and the wheels keep getting stuck in corners. Sofia, being there for the second time, she knew what's in store and refused to lie down in her stroller. Adding to that was a paranoid mother who brought along a huge diaper bag filled with napkins and diapers and milk and a water tumbler... Iz was kind enough to carry the bag for me, though. At one time, Iz was so focused on getting the toy boxes down from the rack that he just left Sofia in her stroller at his back. I was looking at the rack and couldn't reach. He immediately came to me, leaving Sofia. I reminded him there and then (nearly scolding), DON'T JUST LEAVE HER LIKE THAT! The one thing that kind of pissed us was that most items didn't have a price tag. Iz had to carry a few boxes (play gyms were in boxes) to the cashier in front to check for the price. After countless of boxes, we finally found one (on the rack at the back) that suit my budget. Wanted to get KFC but the line was too long so we just take pictures in front of a Christmas tree at the centre court and head home. Iz drove to a RnR nearby and we simply ordered KFC by drive-thru only. Having a baby, gotta be smart eh. So yeah. 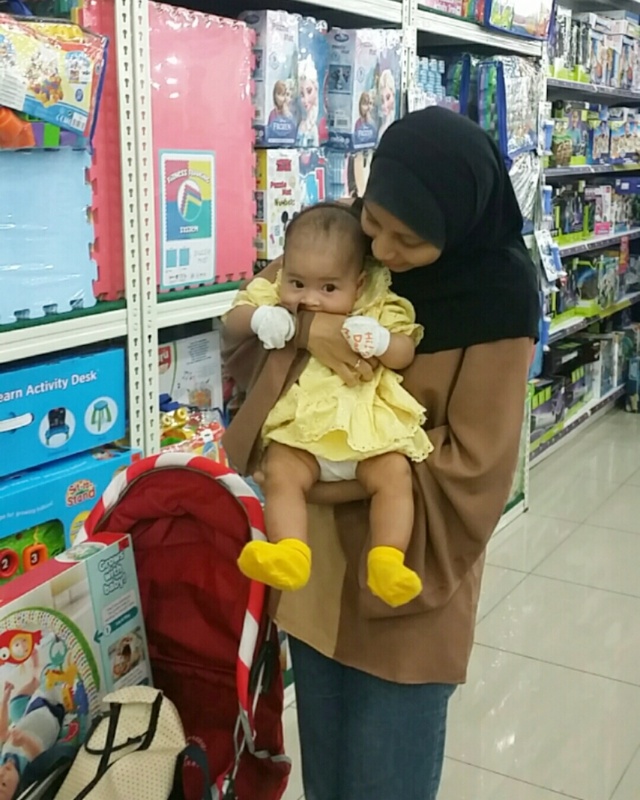 That sums it all; going all the way to IOI City Mall just to get Sofia a toy. uihh, exspensivenya toys ! mek bnyk beli lazada kalau soft toy tu. bashh, gigih nya check price 1-1. kenape x approach staff pastu mintak die tunjuk je which one yg suit ur budget. Untungnya, Fiza! Ini cucu sulong untuk dua-dua family... Jadi kalau ada pun orang lain yang bagi. Bukan adventure sikit, adventure banyak! Hahahah... Entahla tak terfikir pulak nak bertanya. Price checker pun takde pulak kan.
Memang, sya... Kadang kita yang terlebih excited! Sebab sekarang pun dah macam-macam dah toys, tak macam dulu limited sikit.